In 1948, a young mathematician published a paper in an obscure technical journal. 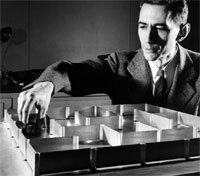 For Claude Shanon, the mathematician in question, communication was purely a matter of sending a message composed of what he called bits over a noisy channel so that someone else could recover it. Whether the message was meaningful, he said, was “irrelevant to the engineering problem.” Shanon’s paper made information an intellectual buzzword. He talked of how tiny bits combined to create information systems, like the alphabet for example. The fledgling computer sciences used Shanon’s theories and in two decades the American mathematician was recognised as the father of cyber communication. But tiny bits—irrelevant in themselves—contributed to information systems much before Shanon theorised about communication. In The Information, A History, A Theory, A Flood, science writer James Gleick takes us on a tour of communication systems from pre-alphabet days to the modern day information glut. He notes, for thousands of years, people exchanged information without theorising about it. Gleick begins by describing how the drum rhythms of people in Congo confounded European explorers. In the 19th century, European visitors would arrive at villages where no one from the continent had been before and find the village elders were already prepared to meet them. The drum language was understood by only one European, John Carrington, an English missionary who realised how the structure of the local Kele language made drum language possible. According to Gleick, the story illustrates the central precept of information theory. Information is an abstract concept, which can be embodied equally well in human speech or in writing or in drumbeats. Shanon was reiterating that precept. Gleick recounts oft-told tales about the invention of Chinese and Indian writing systems and the compilation of the Oxford English Dictionary along with the stories of lesser-known structures of coding. In the late 18th century, more than half-a-century before Samuel Morse’s telegraphic code for example, the Chappe brothers of France invented the first “telegraph” in the form of a network of hundreds of towers with which the government could relay messages from Paris to Bordeaux in less than a day. Gleick’s story then moves to Shanon and the modern age information explosion. We have computer algorithms that convert speech into writing, and translate from one language to another. The pop science writer believes that information has become problematic. “Libraries contain books, commentaries on those books, commentaries on those commentaries, a catalog, and innumerable “false catalogs,” he writes. The problem, believes, Gleick, is not that there is too much information, but in information we cannot process.